Shopify initially rose in premarket trading after releasing earnings earlier Tuesday morning. The stock turned lower later in the morning as traders reacted to lukewarm guidance and a new offering of stock and other securities for up to $5 billion. "When you look at full-year guidance, it was a very, very small raise. When you're trading at this high of a multiple, you can't have a small raise," RBC's Ross MacMillan told CNBC. An Apple iPad with the Shopify app is displayed at the entrance to the company's headquarters in Toronto, Ontario. 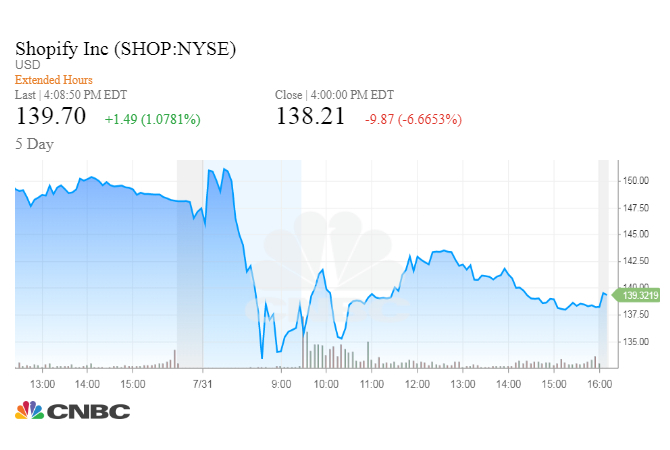 Shopify initially rose after releasing better-than-expected earnings on Tuesday before the market opened. The stock then turned lower later in the morning and ended the day down 6.7 percent as traders reacted to lukewarm guidance, a new offering of stock and a possible slowdown in net merchants added to the platform. The e-commerce company said third-quarter revenue would be between $253 million and $257 million. Analysts expect revenue of $253.2 million. Shopify helps small- and medium-sized businesses run their online operations, by providing such things as file storage space, printing labels, gift cards and fraud detection services. Shopify reported second-quarter adjusted earnings of 2 cents per share, a cent better than the same period a year ago and above analysts' expectations of a loss of 3 cents per share, according to FactSet. The company's revenue also beat estimates, with Shopify bringing in $245 million, a 62 percent jump from a year ago, topping Wall Street's expected $234.6 million, according to FactSet. While the top- and bottom-line results were steady, one analyst pointed beyond Shopify's headline results to a more subtle challenge facing the company. "The incremental dollars were down year over year, which suggests unless there was a radical shift in pricing, which we don't think there was, net new merchants added were down year over year," RBC Markets analyst Ross MacMillan told CNBC. In a separate filing, Shopify said after the bell Monday it would be offering $5 billion in mixed securities over the next 25 months. "Long-term thinking is behind the preliminary short form-based shelf perspective we filed yesterday evening," said a company executive on its conference call Tuesday, according to a FactSet transcript. "Our original shelf expires this quarter. By filing this shelf we retain financial flexibility over the next two years." "To be clear, we consider this to be ordinary course of business given the pending expiry of the current shelf and we have no current intention to undertake an offer in," the executive added. The shares began their significant move lower during the earnings call Tuesday morning. If Shopify is not attracting new merchants to its platform, as RBC's MacMillan suggested, then the company's forecast for the rest of the year looks even worse. "When you look at full-year guidance, it was a very, very small raise. When you're trading at this high of a multiple, you can't have a small raise," MacMillan said. The company also posted a corrected earnings release on Tuesday. Shopify says the corrections were "minor" changes to its wording, as it updated the words "pay" and "payments" in descriptions of the company's products. — CNBC's Tom Franck contributed to this report.